Movie Review: Despicable Me- An Animation Film That Tries Too Hard to Charm While Lacking a Clear Narrative and Direction | Generation Film! The world of animation has a great barrier to leap if it wants to be taken seriously as an art form again. Pixar has done a great deal to make up for the lack of credible animation storytelling that consistently finds its way into the theaters, while Dreamworks has almost matured past their use of stated character and simplistic narratives. However, when a newcomer wants to enter the compacted film market that always ends up honoring mediocrity it inevitably comes as no surprise when the final product slants towards immature children’s entertainment rather than a quality product that can be for all ages. And a mediocre product is what Despicable Me offers its audiences by shoving as much chaotic imagery onto the screen alongside its basic characters and undeveloped narrative. Despicable Me comes off as a movie that tries way too hard to please its audience while at the same time distracting them with fast paced action and way too marketable cute yellow pill shaped creatures. Kids will be pleased with Despicable Me and perhaps parents will find it amusing as well, but really it’s just another mediocre animation film that even is lacking in comparison to Dreamworks. Sure it might make you smile but really it’s a forgettable experience that’s too hectic and immature to be reminiscent of any quality cinema. Despicable Me revolves around a pseudo-Russian accented Gru, who dresses as though he’s Boris Badenov and gets into similar situations as Wiley Coyote. Voiced by Steve Carrell, Gru is an aspiring super villain who devises a plan to shrink and steal the moon to try and out best his new super villain rival: the young and sports suit wearing Vector. Gru is aided by his trusty, idiotic, and overly cute yellow minions who appear to do more harm than good in his plans of evil. And if the minions weren’t a cute factor alone the animation filmmakers also introduce three Orphans that are trapped in a Charles Dickens-esque world of selling cookies door to door for their tyrant keeper Miss Hattie. Basically the lives of Gru and the Orphans come together when Gru sees them as a distracting opportunity to steal a shrink ray from his new arch-nemesis Vector. Of course, the evil Gru never expects to be charmed by these annoying children though our predictions aren’t far off as the script’s predictability of explaining why one becomes a villain is exceptionally childish. The post-modernist appeal of explaining the victim role of the villain has become a trumpeting point for a lot of children’s animation where evil is simply being misunderstood rather than an existing threat. This was a fault of Dreamwork’s How to Train Your Dragon earlier this year and Despicable Me, for all of its charm, falls a bit short due to the fact that an actual threatening antagonist is non-existent. If there are no such things as villains than there is no such thing as a hero, and though Gru transforms in the end to caring for these adorable children the transformation is not felt but rather just fits into the familiar narrative that the filmmakers seemed too lazy to complicate with actual emotions. Sitting in the theater watching Despicable Me in 3D is quite the disorganized experience considering the filmmakers took full advantage of the spectacle that 3D can offer. Slowed down sequences, a barrage of missiles, pointy objects coming out of the screen are all prime examples of the fun 3D can offer for audiences that just absorb what’s in front of them. However, Despicable Me also provides a great template as to what is really unfortunate about the 3D age and how it relates to cinema being pure entertainment. It turns the movie experience into a sort of theme park attraction rather than being there for a story that has relatable or intriguing characters that speak to us in some form or another. The film seems a bit distant when the characters are there to just make the experience a fun ride rather than what filmmaking was intended to do and that is to tell stories or introduce us to different perspectives. Take any of Pixar’s films and you’ll be able to compare in great detail how a dedication to story and character provides a more meaningful theater experience rather than just an amusing one. Despicable Me does have a lot of charm through the voice acting, certain characters, and never allows itself to get boring as it fills the screen with more and more action, but is simply just another mediocre animation film to be added to the countless ones that are produced year after year. Joining Steve Carell in the cast is a plethora of television actors who do a good job at making the experience that is Despicable Me a lively one. Jason Segal offers a slant on his voice making it almost indistinguishable as the young, clichéd Vector and provides for some delightfully random moments throughout the film. The adorable Orphans are voiced innocently enough by Elsie Fisher, Dana Gaier, and Miranda Cosgrove, all of whom bring enough charm to counter balance their basic dialogue and unbelievable character situation. However, it really is the unrecognizable voice of Russell Brand as Dr. Nefario that will really impress those familiar with the actor and makes the situations surrounding the character a bit more comedic. What will probably divide some audiences are the little yellow minions, which will certainly amuse children but annoy parents. They are certainly overused though the filmmakers wanted as much in the film to distract you from the basic storyline so the minions are an easy tool of nonsense to use in this case. At first they are funny and cute, but then they seem to appear everywhere and out stay their welcome as their gibberish acts as a sort of progressive Asian torture technique rather than a consistent humorous occurrence. Despicable Me survives due to the lively cast of characters despite the simplistic narrative they’ve been implanted into, showing just how mediocre an animation film can become. Going to the movies has become such a fall back for low and middle class entertainment that studios try to get away with producing rushed products to just get them into the theaters. However, with animation films there is a lot of planning, storyboarding, and overall work that goes into making them especially if they are in 3D. Despicable Me offers a great deal of charm with the characters, but they are undeveloped and must be accepted in their time and place rather than allowing the audience to connect with them. This is the complete opposite from Pixar who openly utilize the strengths of storytelling to flush out their complex characters. Considering the amount of development and planning go into animation the creators of Despicable Me really have no excuse for their chaotic children’s film. There are some enjoyable moments but that is really just a result of how hard the filmmakers tried to make an amusing film rather than a quality family film. 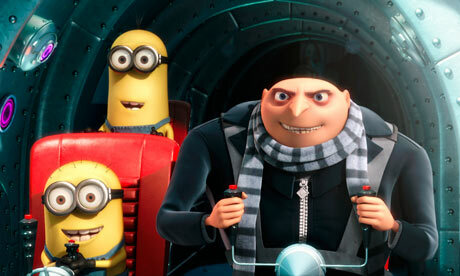 Even in comparison to Dreamworks’ films, Despicable Me falls drastically short.